Lions are the ultimate icons of Africa. They evoke the authenticity of the wilderness and it’s difficult to picture a safari without this apex predator. The great news is that lions are easy to find. Exhilarating and enchanting, these famous cats are found in parks and reserves all across the continent. And it’s very rare that they’re hiding. Lions love to show you who rules the savannah. 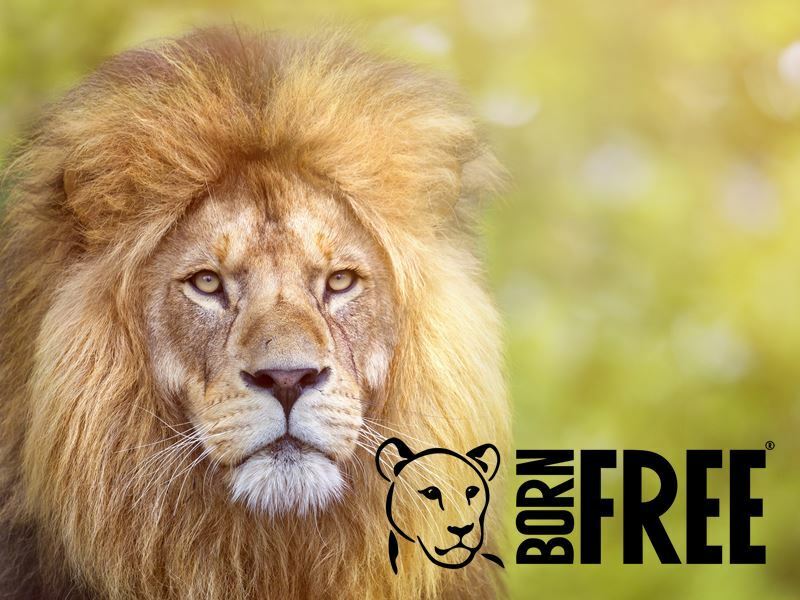 We are supporters of Born Free Foundation, a wonderful conservation and animal rights organisation specialising in the wellbeing of wild animals. Our support has contributed to the incredible initiative that saw young lion King introduced to his natural habitat in South Africa. Imprisoned and abused in an apartment in Paris, Born Free Foundation fought to rescue the young cub, flying him to Shamwari Private Game Reserve in South Africa to spend the rest of his life at the charity’s Big Cat Rescue Centre. The centre will now keep him protected and provide a place for him to freely roam and hopefully be introduced to other lions later on. As avid wildlife lovers and passionate supporters of animal welfare, we are incredibly pleased to be supporting King’s new life in South Africa financially. We oppose of the illegal wildlife trade and keeping wild animals as pets, so we hope that supporting this initiative will bring awareness to the cause. Lions are often spotted lounging in the open, basking in the sun or draped across rocks that rise above the grasslands. See a lion and they register your presence. Goose bumps rise across your arms as they creep closer, then wander around the vehicle. There’s an astonishing silence, everyone too afraid to make a noise as the beautiful predator prowls below. On countless occasions we’ve seen lions drifting off to sleep in the shade created by our safari vehicle. Lions live in prides, mostly consisting of a dominant alpha male, a number of lionesses, and younger males who will be forced out before they become a threat. Sighting lions cubs is something we can’t get enough of, the playful newcomers pawing at their parents’ faces or impishly rolling in the dust. You’ll sometimes see small bachelor prides of young male lions that bare the scars of battle. Watch closely as these prides are regularly quarrelling with hyenas. Lion have broad and adaptive diets, which incorporates just about every other animal. Plains antelope like wildebeest and springbok are a favourite, although the creature most under threat is the zebra. On a safari you’ll be close enough to see black and white limbs torn from carcasses, and hear the crunch as jaws rip through bone. Lions are adaptable animals, happy to live anywhere they can find enough food. Most famously you’ll see them on the savannahs of Southern Africa and the grasslands of East Africa. These open landscapes make lion spotting easy and it’s fairly common to see at least one pride a day. In places like the Serengeti or Masai Mara you might see a new lion pride every hour. Tanzania and Kenya are legendary lion environments and the open grassland offers a great chance of seeing lions on the prowl. But the majority of parks and reserves in Africa are home to lions and it’s very rare that a multi-day safari won’t encounter these majestic beasts. Every safari country has a good collection and each destination understands the importance of the apex predator. They are more difficult to find in forested landscapes as you don’t have the same open visibility. However, the lions are still around and we love how excellent guides know exactly which trees they like to rest under. Not all lions are the same. Those in Botswana’s Central Kalahari have surreal black manes that flutter in the desert breeze. The lions climb trees in Tanzania’s Lake Manyara and Uganda’s Queen Elizabeth national parks, a baffling and unique sight on any safari. Males can develop big and bushy unkept manes, while the lionesses are more elegant and slender. Despite the preconception, you won’t be seeing lions in the jungle. That’s not their habitat, just a misguided impression. Lions are languid creatures and you usually spot them lazing away the day in a classic state of repose. They only need to eat every three or four days, so mostly they’re resting with full bellies. At nighttime their rumbling growls pierce the darkness and echo for a few miles, an evocative noise to keep you company around the campfire. Hear that guttural roar and the guides will already be planning where to take you on the morning’s game drive. We’ll never forget hearing two males showing off their lungs in a competition for a female, then finding the victor at dawn. Lions seek out their prey in the cool part of the day, with the lionesses doing the actual pursuing. At dawn and dusk you can see them on the prowl and we can’t understate the importance of getting an early start. Set off at sunrise and there’s a great chance to see lions and other cats on the lookout for food. But by 8am the lions are either tucking in to breakfast or leisurely lounging around. Over our many visits to Africa we’ve loved how each pride operates differently. In the Okavango Delta we’ve seen lions engaged in daily sunset battles with buffalos. They rile the herds, inciting the big bulls as they seek an easy path to the young calfs. Sometimes the buffalo wins and a lion is trampled. And on other days the hunt works to perfection. In the forests you’ll see the stealthy approach, lions crawling closer for over an hour before pouncing on small antelope. Then there’s the premeditated beauty of a classic pursuit on the open plains, half the pride cajoling a zebra herd to run in a certain direction, with a frightened target galloping straight into an ambush. Lions are a safari constant and so this is an animal that will be quickly ticked off your list. You’ll have seen a photo of a lion before. But nothing prepares you for their size. Lions are much bigger than can be anticipated. And they have a grace that complements their promise of power. Best of all, you can get incredibly close to these majestic predators.